In a four-part series, I’d like to take you along on my #BLBKonMari challenge as I tidy up BLB, room by room. I aggressively committed to knocking out the entire house in a few weeks, but to be completely honest, Part One wiped me completely out (you’ll see why in a minute…)! I decided to begin with my master bathroom. It’s where I begin my day, so it only made sense to start simplifying my life here first. As you can see, every bathroom cabinet and drawer is overflowing with junk. To say I’m a “Product Junkie” is a complete understatement! Makeup, hair products, toiletries, cleaning supplies, travel-size everything – I simply couldn’t take it anymore. So I pulled everything off and out of the drawers, cabinets, shower and countertops and began rummaging through item by item evaluating if it had purpose, was recently used, can continue being used (yes, toiletries expire!) and of course, if it sparked joy for me. You’d think the bathroom would be easier than a closet or file cabinet to declutter and part ways with the contents, but I found that I did have a strange emotional attachment to my bathroom products. When I thought about the amount of money I spent in Target, Sally’s Beauty and Sephora on all of the items, it was very hard to not want to continue to hoard all of them, even if wasn’t using them. 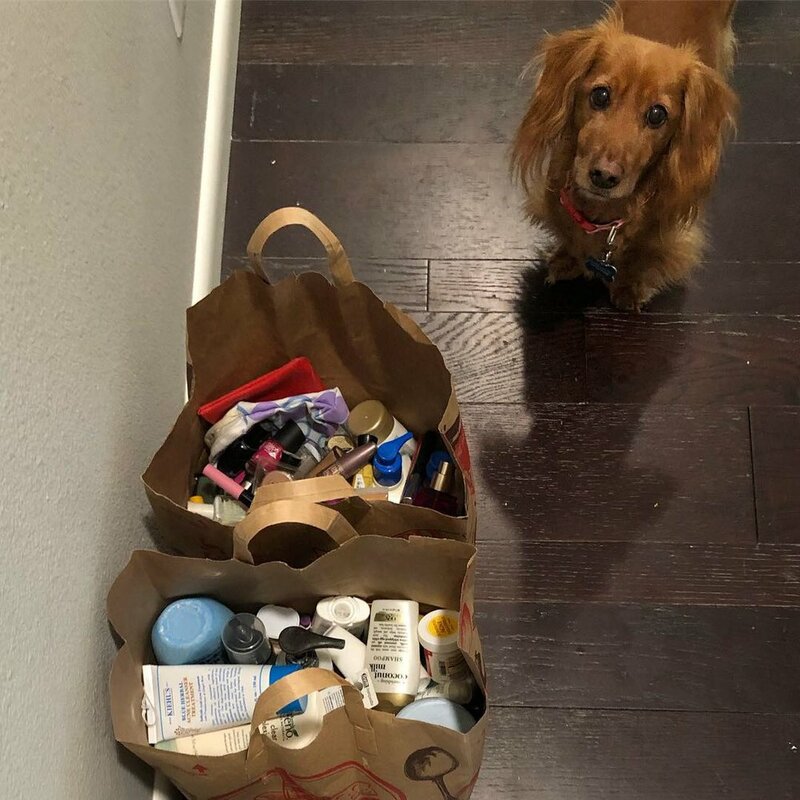 So I pulled out two Trader Joe’s paper bags and filled them with new and gently-used hair products, toiletries and makeup to take to local women’s shelters for those in need. For everything else I decided not to keep, I recycled or threw away. Once I narrowed down everything to what was worthy of keeping, I sorted them into categories and began to plan the best way to store them. For the cabinets, I decided to store my larger hair products that aren’t used as often (hair dryers, sponge rollers, flat irons, flexi rods, etc. ), feminine care products, larger toiletries and cleaning products. In the drawers in-between, I’d divide my makeup, daily-use toiletries (deodorant, facial cleanser, moisturizer, etc.) and travel-size products, and then on the counters, I kept my nail polish, lipsticks and makeup brushes displayed, three glass canisters holding my Q-Tips, cotton balls and floss sticks, my Philips Sonicare toothbrush, toothpaste and liquid soap. Knowing I had a ton of hair products left to store, I went on a shopping trip to Target and World Market to purchase drawer containers and a storage cart to not only organize them, but give them better accessibility during my Wash Days and daily styling. As I attempt to simplify my mornings, routines and life, applying Marie Kondo’s KonMari Method to my master bathroom was a great start! After just one week, I’ve felt more productive in the morning now knowing where every single thing is in my bathroom and being able to get ready in a clean space now free from clutter. For more photos of my progress, check out #BLBKonMari on Instagram and stay tuned for my next post as I tidy up my master closet!